A native of Oklahoma, Ray moved to Kona after earning a bachelors degree from Oklahoma State University School of Business. 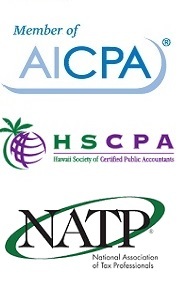 He holds the professional designation of Enrolled Agent, which along with CPAs and attorneys, allows him to represent clients directly before the IRS and State of Hawaii. A member of The National Association of Tax Professionals, he has been doing tax preparation and consulting locally for 17 years, specializing in individuals and small businesses. Rick graduated from Cal Poly San Luis Obispo with a B.S. in Finance and holds an M.B.A. from the University of Hawaii at Manoa. He became a CPA in 1992 while working with the Big Six accounting firm, Deloitte & Touche in Honolulu. His professional experience includes more than 20 years in tax practice, working as the Controller for a non-profit organization and as the CFO of a large family-owned business. Rick works with many individuals, business and non-profit organizations. Don David, a native of Minnesota and graduate from the Minnesota School of Business moved to Kona in 2004 from Sacramento, California. He has worked as an accountant, manager and small business owner for over 35 years. He became a Tax Preparer in 1972 and has been employed by Tax Associates since 2008 specializing in individuals and small businesses.